The U.S. Commission of Fine Arts (CFA) is an independent agency of the federal government of the United States, and was established in 1910. The CFA has review authority over the "design and aesthetics" of all construction within Washington, D.C. In accordance with the Old Georgetown Act, the CFA appoints the Old Georgetown Board. The Old Georgetown Board has design review authority over all semipublic and private structures within the boundaries the Georgetown Historic District. 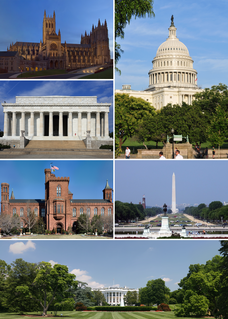 The CFA was granted approval authority by the Shipstead-Luce Act over the design and height of public and private buildings which front or abut the grounds of the United States Capitol, the grounds of the White House, Pennsylvania Avenue NW extending from the Capitol to the White House, Lafayette Square, Rock Creek Park, the National Zoological Park, the Rock Creek and Potomac Parkway, Potomac Park, and the National Mall and its constituent parks. The Michigan Car Company was a railroad rolling stock manufacturer located in Detroit, Michigan. Construction of the gallery began in 1916 and was completed in 1921, after a delay due to World War I. On May 9, 1923, the Freer Gallery of Art was opened to the public. Designed by American architect and landscape planner Charles A. Platt, the Freer is an Italian Renaissance-style building inspired by Freer's visits to palazzos in Italy. It is reported that in a meeting with architect Charles Platt at the Plaza Hotel in New York City, Freer jotted down his ideas for a classical, well-proportioned building on a napkin. The gallery is constructed primarily of granite: the exterior of the Freer is pink granite quarried in Milford, Massachusetts, the courtyard has a carnelian granite fountain and walls of unpolished Tennessee white marble. The gallery's interior walls are Indiana limestone, and the floors are polished Tennessee marble. After opening in 1923, the Freer served as the Smithsonian's first museum dedicated to the fine arts. The Freer was also the first Smithsonian museum created from a private collector's bequest. Through the years, the collections have grown through gifts and purchases to nearly triple the size of Freer's original donation: nearly 18,000 works of Asian art have been added since Freer's death in 1919. Freer began collecting American art in the 1880s. In 1890, after meeting James Abbott McNeill Whistler, an American artist influenced by Japanese prints and Chinese ceramics, Freer began to expand his collections to include Asian art. He maintained his interest in American art, however, amassing a collection of over 1,300 works by Whistler, which is considered the world's finest. One of the most well-known exhibits at the Freer is The Peacock Room , an opulent London dining room painted by Whistler in 1876–77. The room was designed for British shipping magnate F.R. Leyland  and is lavishly decorated with green and gold peacock motifs. Purchased by Freer in 1904 and installed in the Freer Gallery after his death, The Peacock Room is on permanent display. James Abbott McNeill Whistler was an American artist, active during the American Gilded Age and based primarily in the United Kingdom. He was averse to sentimentality and moral allusion in painting, and was a leading proponent of the credo "art for art's sake". His famous signature for his paintings was in the shape of a stylized butterfly possessing a long stinger for a tail. The symbol was apt, for it combined both aspects of his personality: his art is characterized by a subtle delicacy, while his public persona was combative. He found a parallel between painting and music and entitled many of his paintings "arrangements", "harmonies", and "nocturnes", emphasizing the primacy of tonal harmony. His most famous painting is Arrangement in Grey and Black No. 1 (1871), commonly known as Whistler's Mother, the revered and often parodied portrait of motherhood. Whistler influenced the art world and the broader culture of his time with his artistic theories and his friendships with leading artists and writers. First described by French art critic and collector Philippe Burty in 1872, Japonism, from the French Japonisme, is the study of Japanese art and artistic talent. Japonism affected fine arts, sculpture, architecture, performing arts and decorative arts throughout Western culture. The term is used particularly to refer to Japanese influence on European art, especially in impressionism. Dwight William Tryon was an American landscape painter in the late 19th and early 20th centuries. His work was influenced by James McNeill Whistler, and he is best known for his landscapes and seascapes painted in a tonalist style. Masami Teraoka born 1936 is a Japanese-American contemporary artist. His work includes Ukiyo-e influenced woodcut prints and paintings in watercolor and oil painting. The Harvard Art Museums are part of Harvard University and comprise three museums: the Fogg Museum, the Busch-Reisinger Museum, and the Arthur M. Sackler Museum and four research centers: the Archaeological Exploration of Sardis, the Center for the Technical Study of Modern Art, the Harvard Art Museums Archives, and the Straus Center for Conservation and Technical Studies. The three museums that constitute the Harvard Art Museums were initially integrated into a single institution under the name Harvard University Art Museums in 1983. The word "University" was dropped from the institutional name in 2008. Harmony in Blue and Gold: The Peacock Room is James McNeill Whistler's masterpiece of interior decorative mural art, located in the Freer Gallery of Art in Washington, DC. He painted the paneled room in a rich and unified palette of brilliant blue-greens with over-glazing and metallic gold leaf. Painted between 1876–77, it now is considered one of the greatest surviving aesthetic interiors, and best examples of the Anglo-Japanese style. The Biblical Manuscripts in the Freer Collection, a collection of six biblical manuscripts, date from the 3rd to 6th centuries. Most manuscripts are written in Greek, one in Coptic. They are important witnesses of the history of the text of New Testament and Septuagint. The collection was established by Charles Freer (1854–1919), industrialist from Detroit, Michigan and is held at the Freer Gallery of Art in Washington D.C..
Sonya Clark is an American artist of Afro-Caribbean heritage. Clark is a fiber artist known for using a variety of materials including human hair and combs to address race, culture, class, and history. Her beaded headdress assemblages and braided wig series of the late 1990s, which received critical acclaim, evoked African traditions of personal adornment and moved these common forms into the realm of personal and political expression. Although African art and her Caribbean background are important influences, Clark also builds on practices of assemblage and accumulation used by artists such as Betye Saar and David Hammons. The Colby College Museum of Art is an art museum located on the campus of Colby College in Waterville, Maine. Founded in 1959 and now comprising five wings, nearly 8,000 works and more than 38,000 square feet of exhibition space, the Colby College Museum of Art has built a collection that specializes in American and contemporary art with additional, select collections of Chinese antiquities and European paintings and works on paper. The Museum serves as a teaching resource for Colby College and is a major cultural destination for the residents of Maine and visitors to the state. Darren Waterston is an American artist who is mainly known for his ethereal paintings. He is represented by DC Moore Gallery, New York, and Inman Gallery in Houston, TX. Rose and Silver: The Princess from the Land of Porcelain is a painting by American-born artist James Abbott McNeill Whistler. It was painted between 1863 and 1865. The painting currently hangs above the fireplace in The Peacock Room at the Freer Gallery of Art in Washington, D.C.
Milo Cleveland Beach is an American art historian and the former director of the Arthur M. Sackler Gallery and the Freer Gallery of Art. Jan Stuart is an American art historian specialising in Chinese painting. She is currently the Melvin R. Seiden Curator of Chinese Art at the Freer Gallery of Art and Arthur M. Sackler Gallery in Washington, D.C.
↑ "Collections | Freer and Sackler Galleries". Asia.si.edu. 2013-03-15. Retrieved 2014-06-06. ↑ "Freer|Sackler: The Smithsonian's Museums of Asian Art - Google Cultural Institute". Googleartproject.com. Retrieved 2014-06-06. ↑ Linda Merrill, a former curator of American art at the Freer Gallery, editor of With Kindest Regards: The Correspondence of Charles Lang Freer and James McNeill Whistler, and co-author of Freer: A Legacy of Art. ↑ Caemmerer, H. Paul. "Charles Moore and the Plan of Washington." Records of the Columbia Historical Society. Vol. 46/47 (1944/1945): 237-258, 256. 1 2 "Charles Lang Freer | About Us | Freer and Sackler Galleries". Asia.si.edu. 2013-03-15. Retrieved 2014-06-06. ↑ "The Freer Gallery of Art | About Us | Freer and Sackler Galleries". Asia.si.edu. 2013-03-15. Retrieved 2014-06-06. ↑ "Freer Gallery of Art To Reopen After Nearly Two Years". newsdesk.si.edu. Smithsonian. 11 October 2017. Retrieved 4 March 2018. ↑ "A Closer Look - James McNeill Whistler - Peacock Room". Asia.si.edu. Retrieved 2014-06-06. ↑ "Freer and Sackler Galleries | Collections". Asia.si.edu. 2013-03-15. Retrieved 2014-06-06. ↑ Bishop, Carl Whiting. "The Carl Whiting Bishop Collection" – via siris-archives.si.edu Library Catalog. ↑ Smith, Myron Bement. "Myron Bement Smith Collection" – via siris-archives.si.edu Library Catalog. ↑ "Benjamin March - A Finding Aid to His Papers at the Freer Gallery of Art and Arthur M. Sackler Gallery Archives". ↑ "Henri Vever - A Finding Aid to His Papers at the Freer Gallery of Art and Arthur M. Sackler Gallery Archives". ↑ Rosin, Henry D.; Lyman, Benjamin Smith; Ueno, Hikoma; Beato, Felice; Rosin, Nancy; Stillfried, Raimund. "Henry and Nancy Rosin Collection of Early Photography of Japan" – via siris-archives.si.edu Library Catalog. ↑ "Archives: Highlights | Freer and Sackler Galleries". Asia.si.edu. 2013-03-15. Retrieved 2014-06-06. ↑ "Asia After Dark - Freer Gallery of Art - We Stand with Japan | Flickr - Photo Sharing!". Flickr. 2011-05-14. Retrieved 2014-06-06. ↑ "Ars Orientalis Freer and Sackler Galleries". Asia.si.edu. 2013-03-15. Retrieved 2014-06-06. ↑ "Ars Orientalis". Freer/Sackler. Retrieved March 20, 2019. ↑ "Fellowships & Internships | Research | Freer and Sackler Galleries". Asia.si.edu. 2013-03-15. Retrieved 2014-06-06. ↑ "Curatorial Research | Freer and Sackler Galleries". Asia.si.edu. 2013-03-15. Retrieved 2014-06-06.